Are you planning for some special event? Want it to be more than perfect? Exoticars limousines can be your ideal partner. How? We offer you special event limousine in Melbourne. So now you can expect the best and comfortable traveling experience. We are striving hard to help you enjoy a truly perfect event. Let us make you and your guests feel special. We promise that you will be treated in royal manner. Regardless of event type and the number of guests we can serve you with a limousine to add a wow factor. Now give a luxurious touch to your special day with us. WHY CHOOSE US FOR SPECIAL EVENT LIMOUSINE HIRE SERVICES? We are a leading limousine hire company in Melbourne. For years we have been serving people here with the most elegant and sophisticated stretch limo rentals. Whether you need it for a wedding, a sports event, or a christening, we are there to help. 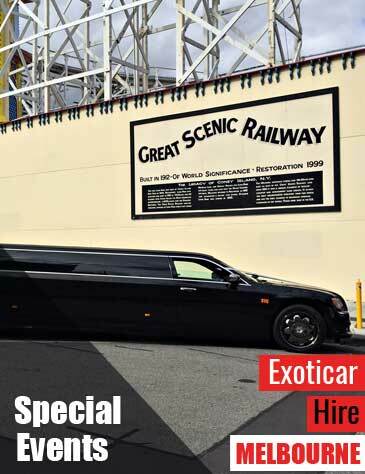 At Exoticars we are strongly committed to offer the best special event limousine. We aim at making your each and every day royal. We have well equipped limos with all the latest features. We promise you uncompromised class. We cater quality and reliability. We offer personalized services as per your requirement. Our valuable customers have been experiencing the highest quality VIP limo transfers and services. We understand the need for a royal ride to your special events. So give a call or book online. Your special event limousines are now available at affordable rates. HOW CAN EXOTICARS LIMOUSINES FOR SPECIAL EVENTS BE BENEFICIAL? When you book our special event limousine hire services, you can rest assure that you are in safe hands. We have a fleet of state of the art, luxurious, and comfortable cars. These are driven by expert chauffeurs who are courteous and experienced. We make sure your safety and satisfaction is taken care of. Exoticars aims at offering special event limousine to as many people as possible. Our charges are extremely reasonable. Not sure what limousine suits your need? We can help you. Feel free to give us a call. Our experienced consultants can assist you choosing the right ride.